We broke up just before the fitness contest began. By we, I mean that once upon a time I had a boyfriend that I was pretty serious about. One month later I am ten pounds lighter and starving for the attention I once had. I’d like to feast on some cuddles and wouldn’t it be great if the love I feel was reciprocated? There is a saying I am thinking of, “Want in one hand, sh*t in the other.” I spent the first couple of weeks after our break-up crying myself to sleep at night. The rejection was unbearable. 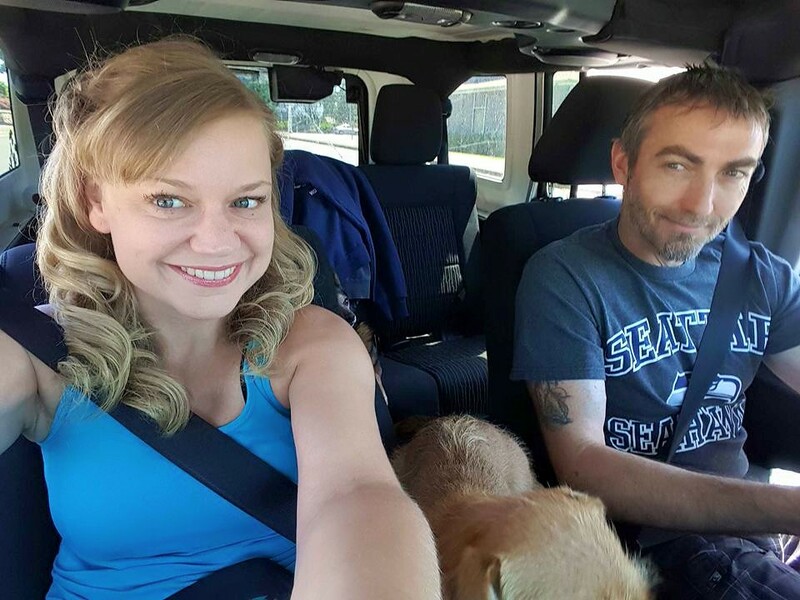 It is a freakish hell to find yourself loved one minute and shut out of it the next. He doesn’t even like to look at me anymore. He keeps his eyes diverted and he always makes sure there is distance between us. He doesn’t message me much either. So I wonder who he is messaging instead. I know he’s on Facebook a lot. This is such an odd thing for me to witness because social media has never been his thing. He’s reserved and also above it all. That was one of the traits I admired most about him. He doesn’t feel the need to be seen and liked by everyone. I thought he preferred it that way. But then I thought a lot of things and we all know how often I am mistaken. I am not on top of the world though. I feel like I have been slighted, like I deserve to have what I see so many other people with. Russell Wilson is planning on proposing to the girlfriend he hasn’t known for more than a minute. Meanwhile, the man I am in love with would rather I go find that experience with another man.The man I love would prefer to see me with someone else, someone other than him. I wake up to stand in those shoes everyday. I put them on and when I do I wiggle my toes with plenty of room to walk away. I don’t though. Instead, I stand firm in the exact same position I was in before we broke up. I don’t want to spend my time with any man. I want to spend my time with him. My daughter is thirteen. Her father and I did an impeccable job spoiling her with a right mind and indulgent opinions. She already knows everything and yet that knowledge is nothing when life is life and love is love. This is inline with what I told her recently about love. and my relationship. “Be careful who you give your heart to then dear daughter, sweet child of mine. I appreciate that you are bothered by my pain. I assure you that I am uncomfortable by it also. I am sorry that I am hard to be around sometimes. I would wish it away if I could. You are disrespectful and far from wise. You think my life is misery because I struggle. Yet you do not honor that your own life is carefree. You want for nothing. You have no struggle. I am your mother. I suffer so you will not. I want you to watch me as a life lesson while you think you can do better than what you can can’t control. You think I deserve better than tears and better than disappointment. Life does not care about deserving. It is fair and cruel to us all the same and love is not about happy endings. Life is about enduring pain just as it is the triumph of having scaled the most treacherous mountain. The journey is not one most survive, but those that do, those that do they stand on the highest threshold of clarity. True love is being able to be open to life and forgiving when it fails you. You are mad at me for loving him while you assume that he does not love me. He has never once told me that he does not love me. Not once. I am the only person in our relationship that every said those words until he started using new words to describe what he feels about me, “You are very special to me.” I wouldn’t let it be enough. What he was able to give was not enough. I wanted too much, all at once, until it feels like we had nothing. That is not true though. You are not yet wise daughter, this is the blessing I have to teach you. Your mother understands love and what it takes. Love is selfless. It is humble. It allowing yourself to be still and quiet in moments that do not need any promise more than that life is fleeting. We are only here for a blink and both of us are at a crossroad where we realize that we may want to have life adventures that are separate from each other. You think you know what is going on between us, and that the separation is a bad thing. You are mad at him because he doesn’t want to be my knight in shining armor prince. Who says he doesn’t want to be? Do you know? Have you asked him? You are not around to see the friend he has been because you are so busy with your own friends. Separation through preparation. He is there for me when the rest of the world is doing that the rest of the world does. He is the one telling me every day to remember my own worth, my own goal. He is the one who laughs at me when I being ridiculous and then he insists I get back to nature, that I take time to enjoy the beauty of life. Then he drops me back off in the city, telling me to get back to it. He reminds me that I have a plan and he supports me while I fail in it. Russell Wilson is a hero because he knows what leaders know. 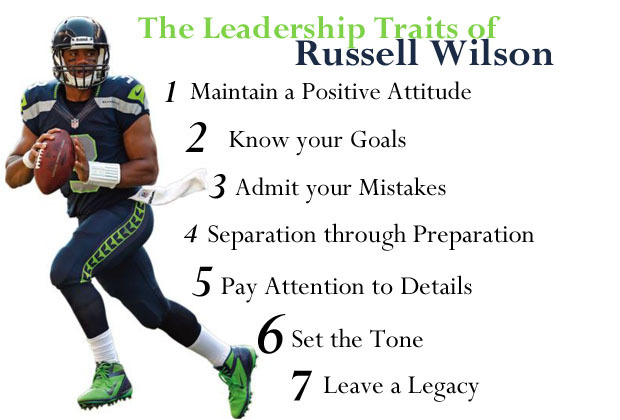 Today I am thinking of a picture graphic I found listing the leadership traits of Russell Wilson. These seven rules are simple, so simple that when you repeat them they almost feel generic. This entry was posted in Uncategorized and tagged #12, Amber Garibay, football, football fan, hero, inspirational, inspire, love, love story, motivation, RUSSELL WILSON, Seahawks. Bookmark the permalink.